Friday is the last day to enter to win Dead Without a Stone to Tell it by Jen J Danna! I have great news and then some not so great news but mostly great news. Here goes: This is our last Pin'inspiration party. No, no. Don't panic: We have something even more exciting for you: How would you like to take classic dishes and turn them into something unique that fits your own lifestyle or sense of fun? Christine from Cook the Story and I, along with the support and participation of the ever-awesome Micki and Marilyn are starting a classic dish makeover adventure that you can be part of too. Our adventure is called The Make It Mine Club and you're invited to join the the club and be a part of it with us. Consider Fettuccine Alfredo. Great dish, right? I would eat it all the time BUT I want to be able to fit through a door so I've needed to change it into something lighter. And then there's this friend of mine who's a strict vegan but her Fettuccine Alfredo cannot be beaten. And my pal Christine, well she was just feeling a bit whacky one day and decided to turn Fettucine Alfredo into a canapé. Even whackier? Somebody over at allrecipes made it into a dessert! See? Right there. Those are chocolate noodles! Seriously. Crazy-fun, right? So that's the idea. Every two weeks we choose another classic dish and all of us (you included) get to go off and come up with our own twists. The twist can be something that fits your lifestyle or just something whacky that you want to try. There's going to be lots of cross-promotion and cross-linking among participants and we'll be getting sponsors on board to tie in giveaways and other fun so make sure you join the club while there's still space! 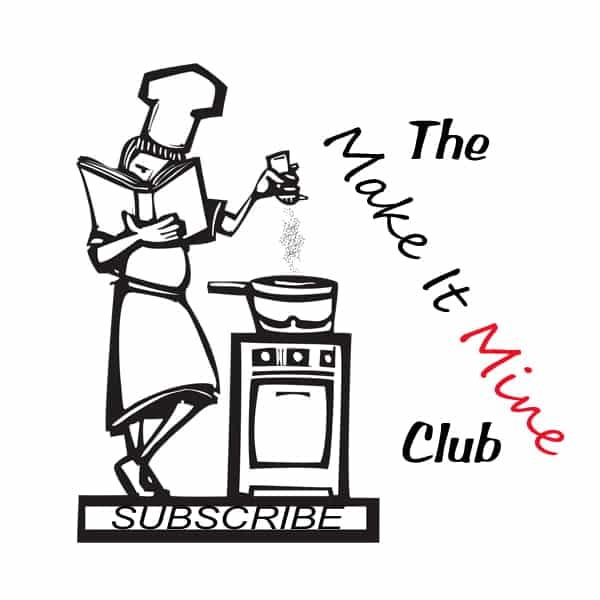 Click here to subscribe to the Make It Mine Newsletter. This newsletter will inform you about what's coming up but will never inundate you. Inside the newsletter you'll get info about upcoming Make It Mine challenges. In each newsletter you will also be given a new link where you can sign up your recipe for the particular challenge. Our first challenge is going to be April 17th and we've got an extraordinary dish picked out: The classic Ploughman's Lunch! Check out our Pinterest board for a bunch of ideas to get those creative juices flowing. And if you don't have a clue what Ploughman's Lunch is (poor you!) check out the always useful Wikipedia for their Ploughman's Lunch entry. After that: May 1st is all about Bangers and Mash and, in case you're worried that we're focusing too much on the Brits, May 15th is Chicken Souvlaki.